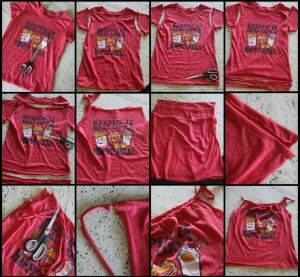 Take an old t-shirt that you already have in your closet and turn it into an adorable, comfortable, and stylish tank top. 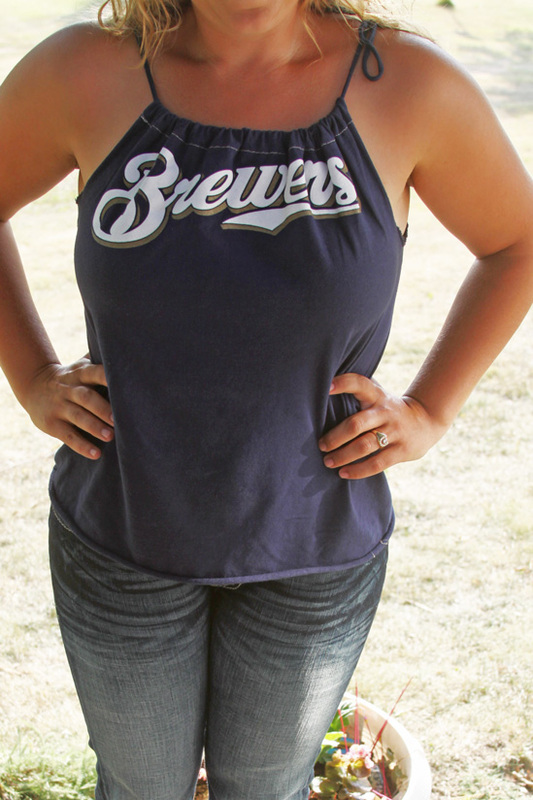 It will take you less than 15 minutes to transform a boxy t-shirt into a tank top that you will want to wear over and over. For Mom’s or for little girls these easy tank tops are adorable! I am super excited to share this easy t-shirt transformation with you! They are so easy but so adorable. I feel like you would pay an arm and a leg for something like this in the stadium’s pro shop. 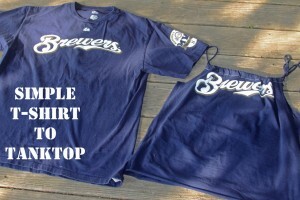 Especially with the player and number on the back! Here is a secret – buy a more inexpensive t-shirt from a department store (like Kohls) in your size and do a 15 minute alteration! Bam! 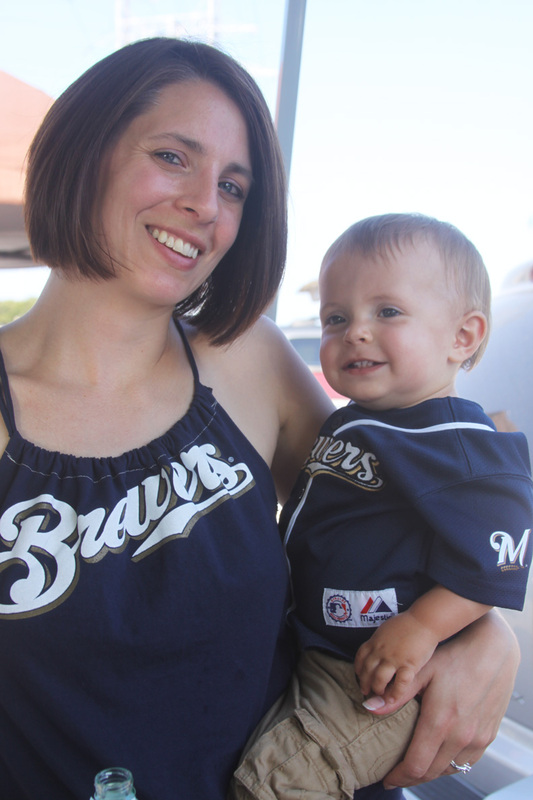 – adorable, frugal MLB gear for less! Since we did this in a short amount of time before the game I didn’t get pictures of the process with the actual shirt in the photo, but instead I will show you the process on a different shirt. 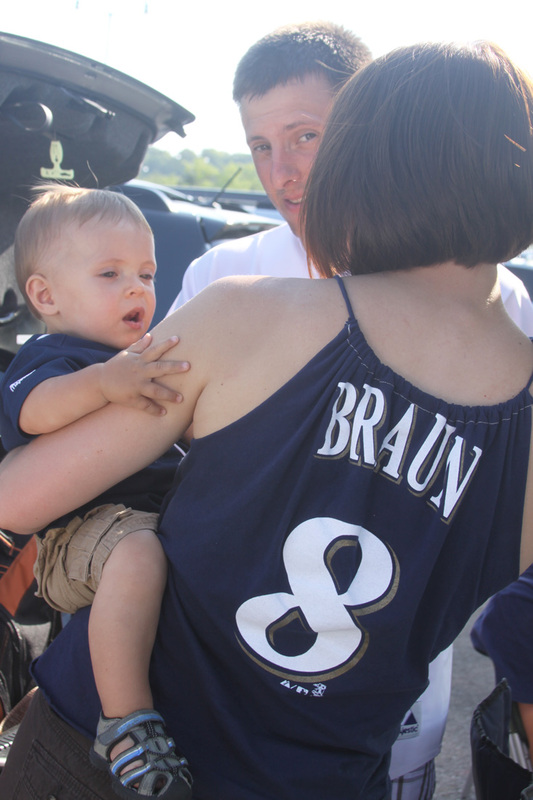 The tank top for the game turned out adorable and we were asked numerous times where we got our shirts. I figured I would do a quick tutorial in case you want to give it a try for yourself. It is seriously very easy and requires minimal sewing and some cutting, that’s it. So here is the step by step – the pictures pretty much explain the process but I will give you a few pointers too. 1. Find a t-shirt that fits you well and grab a pair of sharp scissors. 2. Turn your shirt inside out and cut as close as you can to the seam around the sleeves. The actual seam should be removed with the sleeve. 3. Cut along the bottom of the shirt just above the seam. 4. Using the bottom piece that you just cut off as a guide cut another strip off of the bottom of the shirt *SAVE THIS PIECE) It will become your strap. 5. Now cut straight across the top of the shirt using the bottom of the collar as your guide. 6. Discard all of the pieces except whats left of the t-shirt and the one strip from the bottom without the seam and make one cut to make the bottom ring into 1 long piece of fabric (you can cut it twice if you want to have a strap tie on each side of the tank top). 7. Turn your shirt inside out again and fold the top edges over. You are going to need enough to make a tube to fit your long string of fabric and a safety pin. Pin your hems into place using your straight pins. 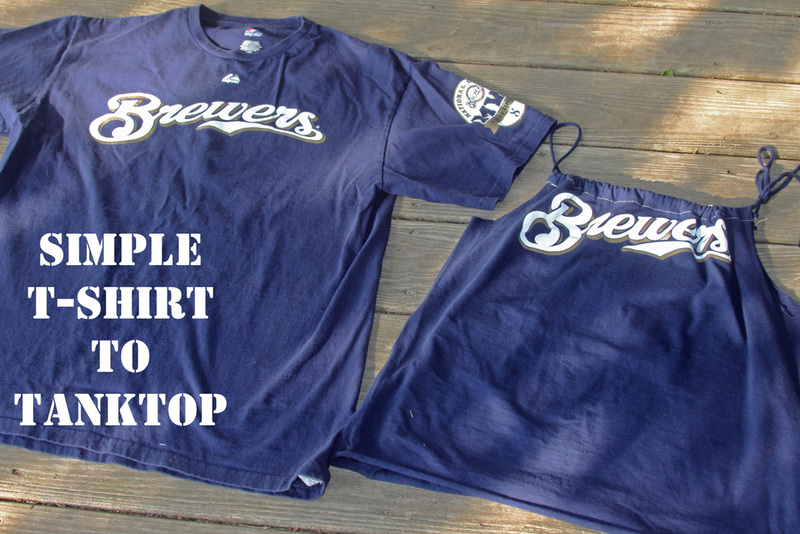 *NOTE* If you have an image on the back of the shirt that you want to include – make sure that you hem the top back so that it is showing like in the picture at the top of the post. 8. Now choose whatever thread color you like and sew a straight stitch across the top of the back and the top of front of the shirt. Remember to do a back stitch at the beginning and end of each hem to secure it, and that you leave enough space to fit a safety pin through. (2 strips of sewing and your done). 10. Attach a safety pin to one end of the long fabric strip that you saved. 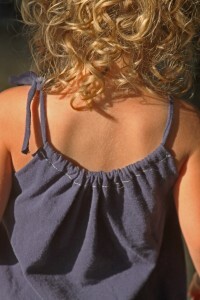 Feed the string of fabric through the top of the front and then the top back of the shirt you. 11. Now tie the two ends of the fabric string into a bow and adjust the shirt around it. There should be a fair amount of gathering and you can adjust it a little easier once it is on. 12. You are done! Now wear and enjoy your cute new tank top made from a t-shirt! These tanks worked perfectly for my sister-in-law and I. They left us cool and comfy, but free to move and take care of our kids at the game without showing too much skin. It was nice to be able to use what we had been given, and create a tank top that we both loved! After we got home I got to thinking about making one for my little girl too. I thought that it would be adorable to have matching shirts for her and I that have our favorite sports teams on them. Then I realized that I had been selling or donating all of her older brother’s sports shirts that he had out grown because they were all pretty masculine. 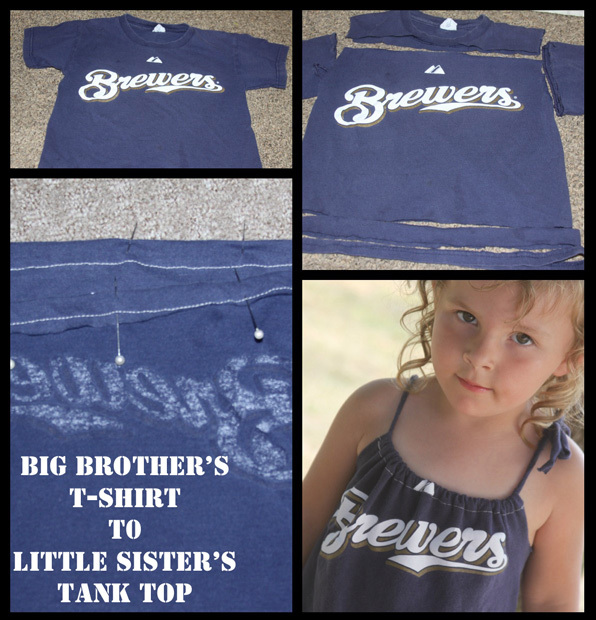 I hit myself square in the forehead with my palm when I realized that this would have been a great way to transform his outgrown shirts into the perfect girly tank tops for her! 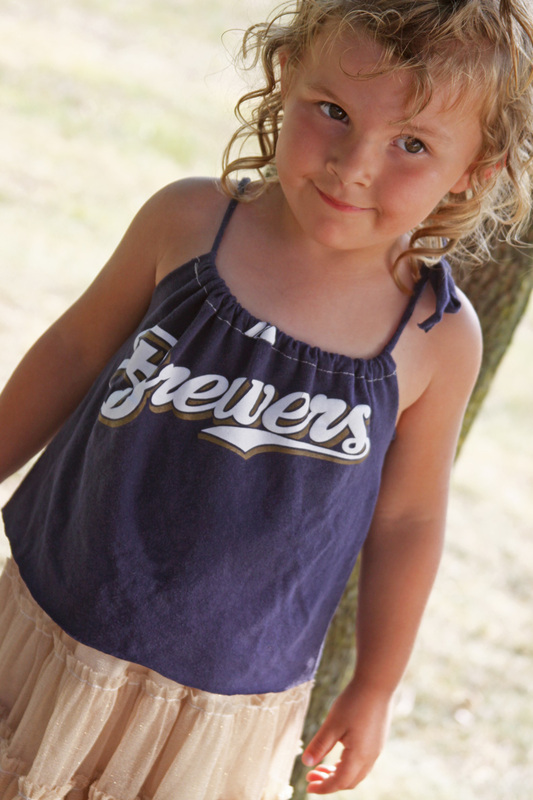 MLB or NFL shirts are expensive, even for kids, and we usually don’t purchase them because of that. The kids usually do receive them as gifts from family members though. This is the perfect way for the shirts that my son receives to do double duty and work for my little girl too! 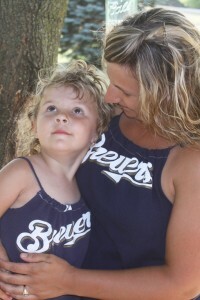 So, I will now be keeping all of those sports related t-shirts or John Deere gear that my son outgrows and creating the perfect tank tops for my little lady to wear. 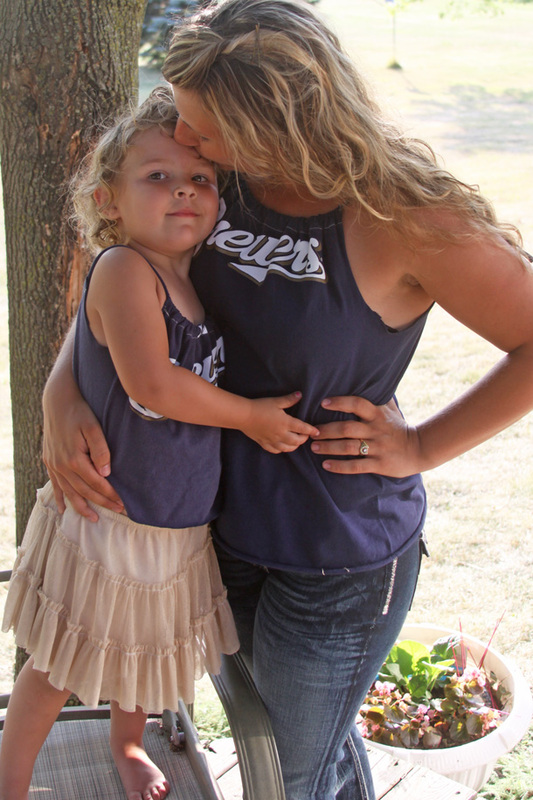 I am overjoyed with how cute the tank top looks on her and she loves that she matches mommy! 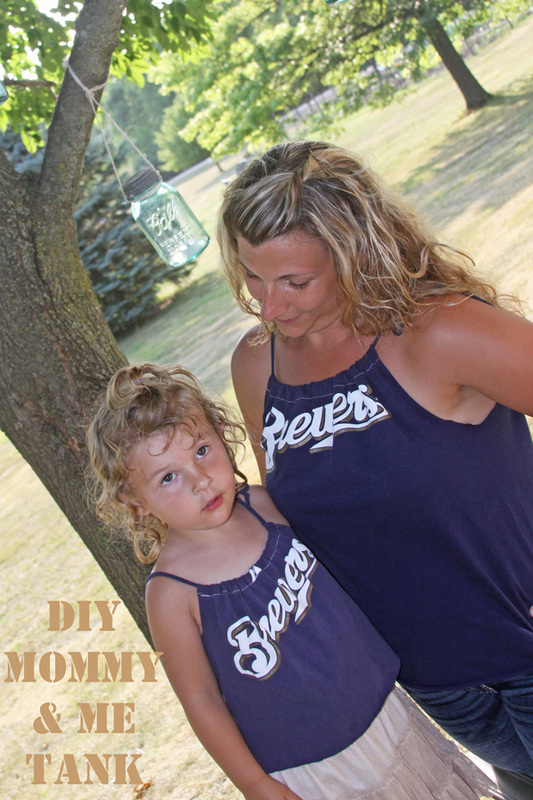 These are so easy to make that I don’t mind the process a bit, and I don’t even really love to sew. The transformation is well worth the small amount of time and effort that it takes. They are as cute in the back as they are in the front with the small amount of gathering! Because the tie is adjustable these will be able to fit for a couple of years too! This one is made in the exact same way as the adult t-shirt to tank top. Just follow the instructions above. My kids are two years apart so his shirts work great just the way they are for her to wear as a tank top. If there is a bigger age gap you may need to put a hem up each side of the shirt to “take it in” a little bit. I would say if the t-shirt fits well as is, then it will be able to be transformed into a tank top. The length is the most important part, and if it is plenty long you are good to go. If you are worried about removing length from the bottom you could always leave the original hem on the bottom, and use a ribbon as the straps. That might actually be even cuter! WOW. Thank you so much. This is going to be a killer transformation for several people and they will appreciate it. Love this! And I loved your statement about passing down the clothes — my son is 21 months older than my daughter so we will definetly be using this idea!